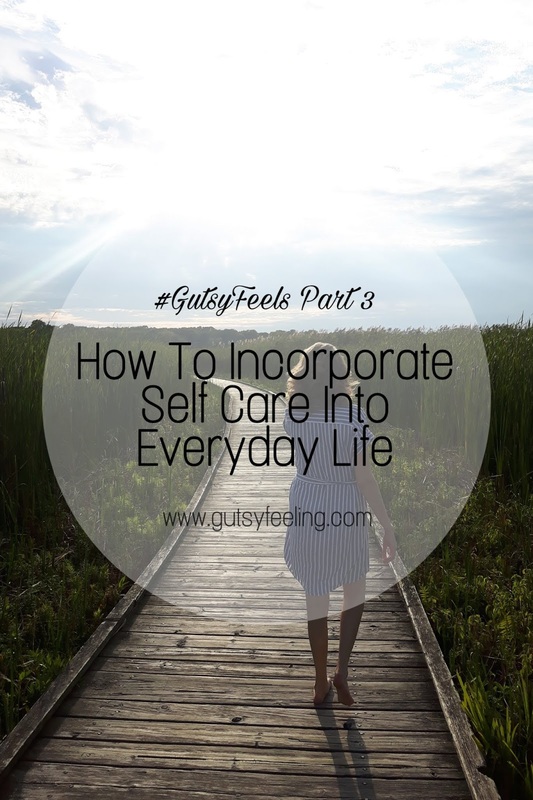 This last post in the #GutsyFeels series is focused on self care. I think this is a great way to wrap up this little series because self care is truly at the heart of self love and happiness. Many people find it hard to incorporate self care into their life because they think they have to draw a bath, or read a book for 2 hours. Although this is nice to do, for many it is just not possible with our busy schedules. However, hope is not lost for those of us that are busy. In this post I will be sharing a few of my favorite ways to incorporate self care into little moments of your day. Self care is so important for our physical and mental health. Our mind and bodies need rest and so we need to make sure that we prioritize self care for our health. This is especially important for those of us who are living with a chronic illness. Many people with chronic illnesses have major fatigue, joint issues, among many other problems. This can take a toll on your body and so treating your body nicely is one of the most important elements in living a healthy and happy life. At the end of this post, I will have another printable journal prompt to help you brainstorm your last goal in this series. This will be based on adapting a new self care habit. So, without further adieu, here are my top self care tips and tricks. For many people mornings can be rushed and frantic. However, this does not exactly set us up for a centered and mindful day. So instead of jumping out of bed and rushing around, I encourage you to get up 15 minutes earlier for some me time. This could be a great time to incorporate some meditation, affirmations and daily intentions, some journaling, or some reading from your favorite book. Anything that makes you happy and preferably without distractions (no electronics). I personally get up 15 minutes early everyday to do morning pages (stream of conscious writing for 5-10 minutes), and then I will meditate and incorporate my daily affirmations and goals. This starts my day off in a great way because I am doing something for ME right away. For more info on my morning routine, check out this post. We have all got to eat right? So why not take a little extra time to make something yummy and nutritious. Whether that be your favorite recipe or a new recipe all together, it is a great way to spend time by yourself, be creative, and give your body some good nourishment. Often we are so rushed, and distracted (on our phones) when we eat. So, I urge you to try to eat this meal with family, a friend or simply in solitude. No matter the case try to really enjoy every bit and be mindful of what you are eating. This is also a great time to add in a little gratitude for the yummy food you were able to prepare. Regardless, feeding yourself a yummy and nutritious meal is an amazing act of self care. Many people sit all day, whether that be at work or at school. So, it is especially important to get moving, and to go outside everyday. I’m not going to harp on this too long, but it really is so important to move your body, whether that be at the gym, going for walks, running, yoga, biking, skipping rope, dancing, the possibilities are endless. Try to move everyday and to get outside to see the sun everyday as well(even in the cold winter months). This not only will make us feel better, but it will help with our natural body clock. If we stay inside too much our body clock gets thrown off and this can make it harder for us to sleep. Every night we go through the same motions of doing our skin care, body care, etc. However, we probably rarely take the time to enjoy this process. Instead of quickly lathering on some cream, try taking your time and really enjoying this time to yourself. To really enhance this experience, try adding one new beauty product into your regime. This could be adding a new body oil, adding a face mask one night, or a hair mask another night. Whatever it may be try to really be mindful of this process. The more time you have the more you will be able to do, but starting with one new product can be an easy way to make sure you are doing a little something extra for yourself. I’m sure you have heard this a million times before, but hydration is so important. After all, the human body is made up of 60% water. Throughout the day, we remove water from our bodies through sweat, urine and other ways. Therefore, it is super important to replenish our bodies water supply by drinking at least half of our body weight in water. Get yourself a reusable water bottle and bring it EVERYWHERE. For anyone that knows me personally, they would know that I always have a water bottle on me. So, follow my lead and stay hydrated. Social Media can be an excellent source of inspiration. Unfortunately, it can also be a pit for hate and jealousy. Therefore, take the time to go through your social media and unfollow or unfriend people that are hindering your positivity or inspiration. This is especially important for your mental health and confidence. If you are worried about hurting your friends or families feelings, there are features on both Facebook and Instagram which allow you to remain friends but to stop viewing that friends posts on your timeline. This can be a small act of self care that you can do every few months in order to keep your digital world a positive environment. An easy habit to add into your daily routine is to listen or watch inspiring content. The internet is flooded with inspiring podcasts, videos, books, and music. This means that there is an abundance of resources to help you feel inspired, learn, and boost your mood. Try listening to music when you wake up to put you in a happy mood, or listen to a podcast on your way to work that makes you laugh or smile, or buy a book about a new topic you are interested, or watch inspiring videos to help get you get motivated. By doing so you are taking control of what you are listening to, learning, and hearing, therefore you are controlling your mood. Being Boss by Emily Thompson and Kathleen Shannon is great for entrepreneurs. Kalyn’s Coffee Talk by Kalyn Nicholson is great for life motivation and introspection. The School of Greatness by Lewis Howes is great for tips on owning your own business and succeeding in your dream life. 99% Invisible is great to learn a whole lot about a very specific topic, in a short amount of time. Science Vs. by Gimlet is a great podcast to learn something new about scientific discoveries and phenomena’s. Just like your morning, it is important to incorporate self care into your night time. This can be done by creating a night routine that can help you to unwind, clear your head and get ready for sleep. This routine will look different for everyone based on your lifestyle, career, age, etc. However, no matter what the circumstances may be, incorporating a night routine is a great way to finish off the day. I personally start my night routine about 45 minutes before I want to be asleep. I will start by setting up my essential oil diffuser with some lavender essential oil. I will then get into bed and start my journaling, which will include 2 journals. First, I will use my “worry journal” to write down a quick list of everything that is worrying me today. Typically this has similar stuff everyday, for example, work, school. projects, etc. My second journal is then used for logging my food and symptoms for the day and writing down 5 things I am grateful for. Once, this process is done I will pray and meditate. During my nightly mediation I like to remind myself of my affirmations. Some of which include “The Universe is for me, and so is everything else” and “I am not a victim, I am a warrior”. Using affirmations is a powerful tool to help end your day on a positive note. I will then finish my night with some reading until I can’t keep my eyes open. Overall, your night routine should be a great way for you to calm down and unwind. It should be a lovely way for you to end your day that way you look forward to it every single day. To know more about my night time routine check out this past post. This brings us to the end of my tips and tricks on improving self love, happiness, and self care. Now it is your turn to reflect and really set up your goals so that you can improve your confidence and happiness. To help wrap up this mini series, use today’s journal prompts to help you set new self care habits. I hope you enjoyed this series and found it useful in some way. If you did like it, let me know by commenting down below, tagging me in a post on Instagram sharing your thoughts, or directly messaging me on Instagram. Make sure you subscribe to my email list for my blog to get updated on my new post every Sunday. Also, follow me on Instagram for more day to day updates on my life. What will you do today to incorporate self care?